Iperf is a neat little tool with the simple goal of helping administrators measure the performance of their network. Worthy of mention is the fact that it can measure both TCP and UDP performance on a network. Iperf is cross platform software and open source. We will be making use of the command line, do not fear the command line Iperf is a simple tool to use. Say I want to test the available bandwidth between a server(Windows Server 2008) and a client workstation(Windows 7). Iperf will try to move as much data as possible using the available link in order to conduct the test. Download the Iperf executable and place the file on any directory you wish, my web browser(Firefox) places all downloaded files on the Download directory which is where I will be executing Iperf from. 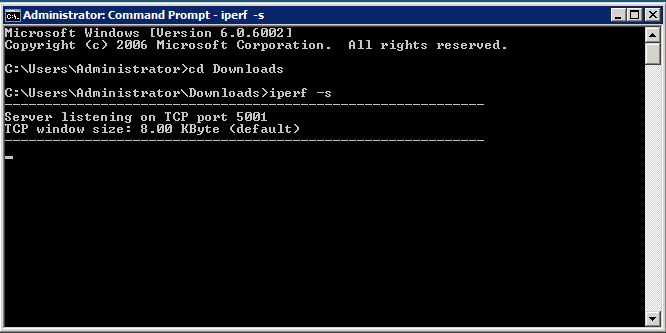 Note:You will need to open port 5001 on the Iperf server. or the location where the Iperf executable resides. to start the Iperf server. If you look at the screen Iperf listens on port 5001 you may have to open port 5001 on your firewall.
. This will be our client and we are telling Iperf the server is located at 192.168.1.51. Give Iperf some time to test the connection, after the test is done Iperf will present the results. The results are easy to understand in this case Iperf managed to transfer 113 Mbytes at 94.5 Mbits/s, the results will changed when used on a busy network which is where Iperf will reveal the amount of available bandwidth in the network.